A scoff, a scoff, my kingdom for a scoff. We are in the home straight for my blog round up and we are now at the real reason I started it. I wanted to let people know about places that may not appear in the usual tourist guides but offer good value for your money. I’ll give a wee bit of general advice and then we’ll revisit some of my favourite places. Regular readers of the blog know that I bang on incessantly about the “Menu Del Dia”. This is the 3 course menu that many restaurants offer between 1 and 4 of an afternoon. During the week you’d expect to pay around 9/10 euro with around 12 to 15 on weekends or bank holidays and remember that price includes a bottle of house plonk. If you are on a budget you can have a great meal in nice surroundings that will set you up nicely for the day without it depleting the holiday fund too much. If you’ve had a nice lunch then come night time you are set up nicely to “do tapas”. 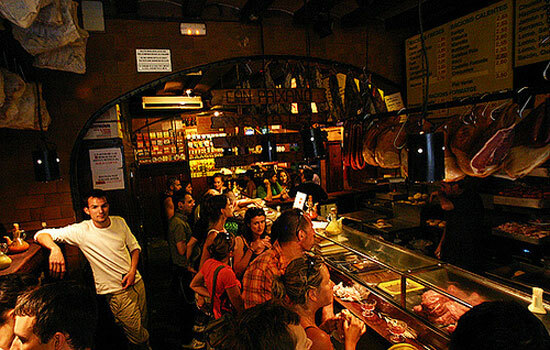 The general rule for tapas is have a look at what tapas they have on display on the bar top displays. If it looks fresh and tasty then you should be fine. Another thing to remember about tapas is that it’s a marathon, not a sprint. Don’t fall into the trap of ordering loads of different dishes at one go. You’ll be surprised how filling they can be. Order 2 or 3 dishes, polish them off and then order some more. Is that all clear? Okay, we’ll move onto one my favourite places, which has stood the test of time. 7 You’re Cava-ing a laugh The first of my favourites is the cava bar known locally as “The Champaneria” but in guide books and the like as Can Paixano. It’s very rough and ready, there are no seats and is normally rammed. You are going to get bumped and bashed around but don’t let that put you off. It’s all part of the experience. As it is Barceloneta this place is ideally placed for a scoff either on way down to or way back from the beach. The food is very basic, simple sandwiches or plates of ham, cheese or fried sausages. If you buy two plates then you can buy a bottle of their cava. A quick scan around and you’ll see most people are tucking into the Cava Rosado (Rose) don’t swim against the tide. It’s like a delicious alkie Vimto. This place used to be ridiculously cheap, a few years back a bottle of cava and two plates was around the 8 euro mark. Now, you should expect to pay between 10 and 12 euro but for two people and bearing in mind the quality of both the food and the cava,that’s a price worth paying. At the back of the bar they have a little deli and you could do an awful lot worse than load up on some of the meaty and swally goodness on offer. I’ll wrap this entry up here and the next one will be another two of my favourite places and a general entry with five or six recommendations specifically on good menu del dia venues. As a man who follows a few blogs I’ve worked out that anything more than 600 words gets the “too long, didn’t read” treatment. Cheery bye until the next time.